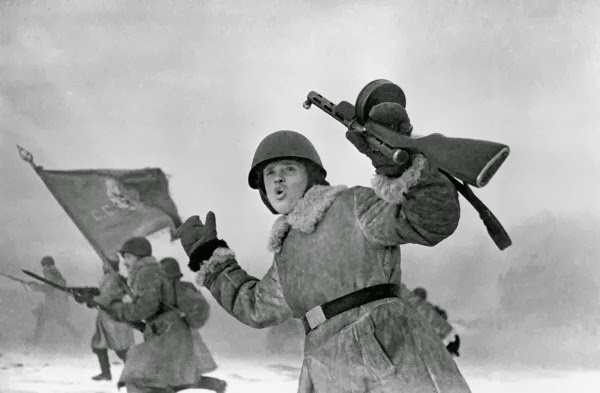 The Red Army completed its encirclement of the German Sixth Army at Stalingrad on November 23rd 1942, roughly mid-way through the five-month long battle. Code-named Operatsiya Uran, the generals of the Soviet Union had in mind nothing short of the annihilation of the Sixth Army, the Third and Fourth Romanian armies and parts of the German Fourth Army. They had conducted the relevant intelligence before launching two massive pincers from the north and south that was intended to trap over 270,000 axis soldiers. On November 19th, Soviet forces attacked and quickly destroyed the Romanian Third Army which was nominally protecting the flanks of the Sixth Army. The Germans and their allies who were lacking in fuel, ammunition and rations, could only muster a chaotic defence, and the battle objective was achieved much quicker than the Soviets had expected. It was the beginning of the end of a fighting force which Hitler had once told Friedrich Paulus “could storm the heavens themselves”. Hitler ignored the advice of German military commanders to break out of the encirclement and opted to hold the position on the guarantee given by Herman Goering that the Sixth Army could be resupplied by the Luftwaffe. This operation would be an abysmal failure. The German High Command entrusted Field Marshal Erich Manstein with a last-ditched effort to rescue the trapped army. Manstein, the deus-ex machina of the German Wehrmacht, who had overseen the blitzkrieg victories over Poland and France, as well as a string of successes on the eastern front which culminated in the capture of Sevastopol, was given command of the German 4th Panzer Army. On December 12th, the Sixth Army heard the distant sounds of Manstein’s operation, Unternehmen Wintergewitter, but he could not break through the Soviet ring and the fading noise of gun fire and artillery shelling signalled the Sixth’s Army’s doom. Die Rote Armee hat im November und Dezember dieses Jahres diese Aufgabe erfullt. Nordwestlich und sudwestlich von Stalingrad sind die Russen 70 bis 150 km vorgeruckt. Der russische Vormarsch sudlich von Stalingrad umfasste 110 bis 150 km. Am mittleren Don sind die Russen 1.50 bis 200 km vorgerruckt. Im Ganzen sind 20 deutsche und 2 rumanische Divisionen bei Stalingradfronten betrugen im November und Dezember allien 170.000 Tote und 137,000 Gefangene. Dort allein hat Hitler in diesen 6 Wochen 312.000 Mann verloren. Die Russen erbeuteten und zerstorten ungerheure Mengen an deutschem Kriegsmaterial. Darunter mehr als 400 Flugzeuge und mehr al 5000 Panzer. Mit grosser Genugtuung konnen wir feststellen, das amerikanisches und britisches Kreigsmaterial am Erfolg der Russen einen wichtigen Anteil hatte. The Red Army has accomplished this task in November and December this year. To the north-west and south-west of Stalingrad, the Russians advanced 70 to 150 km. The Russian advance south of Stalingrad covered 110 to 150 km. On the middle Don, the Russians advanced 150 to 200 km. On the whole, 20 German and 2 Romanian divisions are surrounded at Stalingrad. The German losses on the Don and Stalingrad amounted to 175,000 dead and 137,000 prisoners in November and December alone. Hitler lost 312,000 men during these six weeks. The Russians captured and destroyed immense quantities of German war material, including more than 400 aircraft and more than 5,000 tanks. We are very pleased to note that the American and British materials played an important role in the success of the Russians.